Citation Information: J Clin Invest. 2007;117(3):823-834. https://doi.org/10.1172/JCI26833. Peripheral T cell lymphoma, unspecified (PTCL/U), the most common form of PTCL, displays heterogeneous morphology and phenotype, poor response to treatment, and poor prognosis. We demonstrate that PTCL/U shows a gene expression profile clearly distinct from that of normal T cells. Comparison with the profiles of purified T cell subpopulations (CD4+, CD8+, resting [HLA-DR–], and activated [HLA-DR+]) reveals that PTCLs/U are most closely related to activated peripheral T lymphocytes, either CD4+ or CD8+. 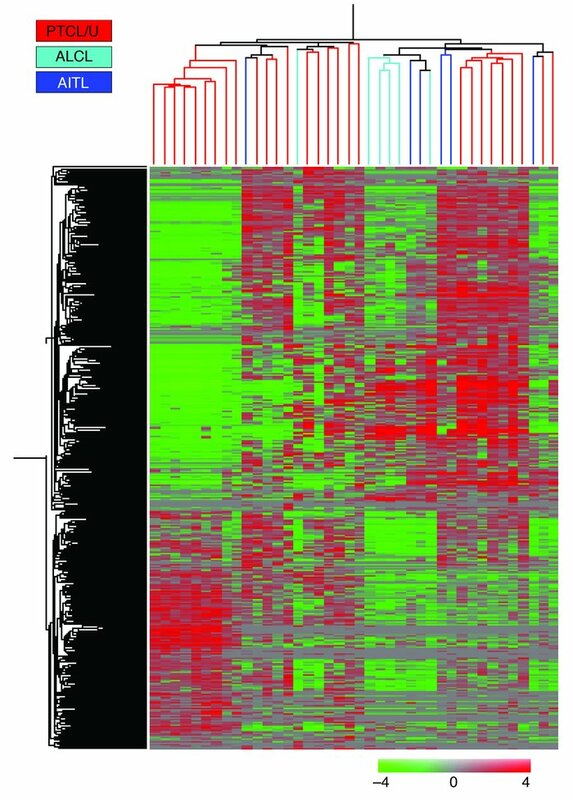 Interestingly, the global gene expression profile cannot be surrogated by routine CD4/CD8 immunohistochemistry. When compared with normal T cells, PTCLs/U display deregulation of functional programs often involved in tumorigenesis (e.g., apoptosis, proliferation, cell adhesion, and matrix remodeling). Products of deregulated genes can be detected in PTCLs/U by immunohistochemistry with an ectopic, paraphysiologic, or stromal location. PTCLs/U aberrantly express, among others, PDGFRα, a tyrosine-kinase receptor, whose deregulation is often related to a malignant phenotype. Notably, both phosphorylation of PDGFRα and sensitivity of cultured PTCL cells to imatinib (as well as to an inhibitor of histone deacetylase) were found. These results, which might be extended to other more rare PTCL categories, provide insight into tumor pathogenesis and clinical management of PTCL/U. Unsupervised hierarchical clustering of PTCL/U, AITL, and ALCL. Unsupervised analysis performed on 28 PTCL/U, 6 AITL, and 6 ALCL samples. The 40 samples are clustered according to the expression of 417 genes. While ALCLs roughly cluster together, AITLs are scattered within PTCL/U.